Global Animal Feed Organic Trace Minerals Market size was valued at over USD 500 million in 2017 and is anticipated to witness over 5.5% CAGR up to 2024. Dairy & meat production growth across the globe owing to consistently increasing consumption will enhance the animal feed organic trace minerals demand. As per FAO, global meat production is expected to be 16% higher by 2025 compared to 2016. Poultry meat consumption is the major growth driver in overall meat production. Factors such as low production costs and lower product prices are anticipated to propel the poultry meat as a preferred choice for both producers and consumers in developing countries. Rising consumer awareness pertaining to the cattle health along with the rising cases of side effects caused by meat consisting toxic chemicals will augment the demand for sustainable feed supplements. A positive outlook toward superior quality meat consumption will drive the overall market growth. The inclination of customers toward maintaining the feed quality is expected to positively influence the product penetration. In addition, major health issues such as chronic illness, bovine spongiform encephalopathy, and microbial contamination owing to the nutritional deficiency in the feed will foster new opportunities in the industry. The market is expected to witness a rapid growth owing to the increasing awareness regarding the feed quality in animal nutrition. Organic trace minerals act as a cofactor for enzymes such as glutathione reductase superoxide dismutase, glutathione peroxidase, ceruloplasmin, thioredoxin reductase, and catalase. These enzymes are essential for building the immune of animals as they help in maintaining appropriate homeostatic mechanisms and efficiently moderate the physio-biochemical processes such as enzyme, protein, & hormone synthesis. Also, increasing organic trace mineral utilization for the activation of essential enzymes & hormones in livestock vital for better metabolic processes will influence the product penetration in feed industry. Other key health factors such as optimum wellbeing, skeletal development, and immunity will positively support the industry expansion. Strict government regulations and norms by international organizations such as the FDA and REACH towards unsafe fodder production and inorganic product consumption will proliferate the business expansion. In addition, significant micronutrient elements to be used in poultry diet are mandatory to undergo a strict approval process by these regulatory bodies which will further enhance the product penetration. However, R&D costs for the product development are higher as compared to inorganic counterparts, which may hamper the animal feed organic trace minerals price trend. Zinc accounted for more than 35% of the share in 2017. Key benefits including metabolism rate improvement along with immunity enhancement in the livestock will propel the animal feed organic trace minerals demand. In addition, the growing consumption rate of the product in the structural, functions, coupled with DNA/RNA synthesis owing to the rise in cell proliferation will further promulgate the industry growth. Copper will observe more than 5% gains up to 2024. Copper is involved in the connective tissue formation, energy production, and normal red blood cell formation. Key advantages such as better metabolism, regular nervous system function, neurotransmitter metabolism & synthesis, and melanin formation for hair pigmentation will boost the segment growth in the animal feed organic trace minerals market. In addition, surging antioxidants demand in the animal feed owing to the improper body functions among the livestock will further proliferate the overall industry size. Ruminants accounted for more than 70% of the global animal feed organic trace minerals industry share in 2017. Significant health benefits of ruminants in terms of enhanced nutrient consumption will positively drive the market over the forecast time period. Rising milk demand and its by-products along with the increasing consumption of the red meat across the globe will enhance the product demand. Moreover, rising consumer awareness pertaining to the minerals & vitamins enriched meat variants will further boost the segment growth. Swine is projected to observe over 4.5% gains from 2018 to 2024. Pork produced more than 100 million metric tons of meat and accounted for over 40% of the overall meat production. Broiler stood second in the production and accounted for 23% of the production share. 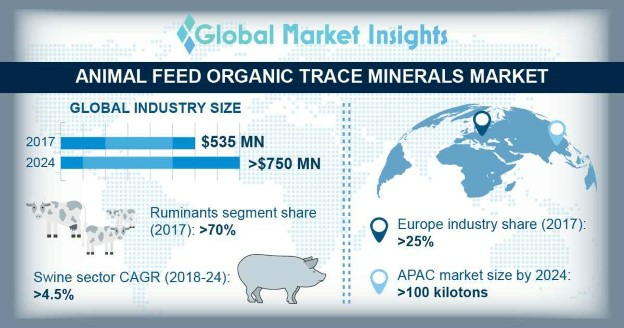 The rising demand for animal protein, coupled with the growing health concerns among the consumers pertaining to the proper intake of vitamins and minerals will support the strong business outlook for the animal feed organic trace minerals market. Europe accounted for more than 25% of the overall animal feed organic trace demand in 2017. Increasing forage additive consumption, such as vitamins, enzymes, minerals, and carotenoids owing to the rising deficiency among the livestock will proliferate the regional industry growth. Significant expansion in the presence of manufacturing facilities for meat and pork products, particularly in France and UK will provide positive scope for the animal feed organic trace mineral market expansion across the region. Asia Pacific is anticipated to surpass 100 kilotons demand by 2024. The region is among the largest meat producer, accounting for more than 40% of the meat production. China is estimated to be the largest producer and consumer of pork, holding 49% of the global pork production in 2016. As per OECD global meat consumption trends, China registered for over 30 kilograms per capita meat usage in 2017. Japan is witnessed to be the largest importing country for pork meat, followed by China, Mexico, South Korea, and the U.S. 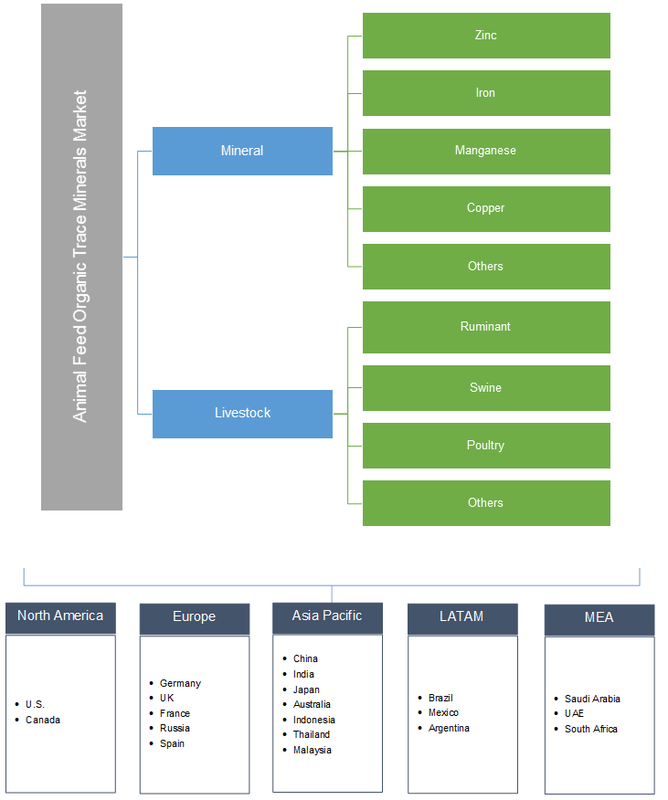 Global animal feed organic trace minerals market share is highly consolidated owing to the presence of few dominating companies including Phibro Animal Health Corp, Novus International, and Alltech Inc. The other key industry participants include Zinpro, Royal DSM, Cargill, Archer Daniels Midland, Pancosma, Ridley, Kemin Industries, QualiTech, Tanke Biosciences, Mercer Milling, U.S. Rare Earth Minerals, Vamso Biotec, Biochem Lohne Germany and Nutreco. Mergers & acquisitions, collaborations, supply chain agreements, and product enhancements are the crucial strategies adopted by these industry players. The manufacturers are involved in the supply agreements with the several end-use industries. For instance, in April 2018, Kemin Industries acquired Unique Beta-Glucan Technology developed by Algal Scientific. Other notable players include. Organic trace minerals are the metallic ions required to resist against major diseases. Reductase, Glutathione, superoxide dismutase, thioredoxin reductase, ceruloplasmin, catalase, and glutathione peroxidase are among the key enzymes acting as an oxidant neutralizer. Enzymes play a significant role against the chemical agents that are produced under different processes and contribute to the general livestock health by improvising their immunity level. Animals utilize the major organic minerals for tissue storage. The adequate utilization of vitamins by the livestock animals helps in making the meat products more nutritious and beneficial for the upper food chain levels in the environment. Organic trace minerals further enhance gut absorption and reproductive system among the animals.